I might be back blogging. I have been too busy/jetlagged/under-the-weather-due-to-overbusyness, etc… Still homeschooling though, so here is today’s best incident. We were doing maths, when Antonia suddenly said “who wrote this book anyway?”. So I turned to the front and read her the names of the authors. “Humph!”, she said, “all men! I suppose that’s why there’s so many boys in it”. I was quite surprised. I hadn’t noticed any such bias. But she is more sensitive to that sort of thing than me, and there certainly were no girls on that particular page. I decided to do a people count to see if she had formed a false impression. The book is divided into five sections, and after counting the first two, I though she was mistaken. The proportion of girls to boys was so close, it showed every sign of having been carefully engineered. Then I got to the third section, the one we are just finishing, and saw that she was very right indeed. Perhaps the worst thing was that I then started noticing the ratio of adult women to men throughout the book, which is very poor. And whilst many of the men were professionals of various kinds, almost all of the few women were somebody’s mother or a customer. Here are my results. I won’t name and shame the maths book. For one thing, I’m otherwise very pleased with it. For another, it’s a French one, so I don’t imagine many people who happen here would be using it. I just thought it was very interesting that some children actually notice these things. So yes, it probably is worth making the effort to be ‘politically correct’. We have reached the stage in maths where Antonia is learning multiplication tables – and enjoying it! It’s the kind of thing that appeals to her. I know there are lots of methods around, but here is the one we chose. We have a set of dominoes that goes up to 12 | 12. The ones we are working with go face down on the table and we pick them in random order. Obviously we started with the easiest ones: anything multiplied by 0, or 1. Then anything multiplied by 10, or 11 up to 11 x 9. Then we did 2 and 5 which was relatively easy, since Antonia can already count in 2’s and 5’s. After that we started taking out the easiest dominoes and adding new ones, one at a time. Her choice of which domino to add is a bit eclectic, so she is not learning the tables in any particular order. This may be a good thing. Also with this method, she realises very easily that 2 x 9 and 9 x 2 are the same multiplicationa and don’t have to be learned twice. I feel it’s going quite quickly, as we are doing the tables up to 12 x 12 and we are now down to 20 dominoes still to learn. For some reason, the French schools seem to take about three years to get through the multiplication tables, but that seems excessive. I’ve also noted that she is good at recalling the multiplications she knows when it come to doing problems in her maths book. I think avoiding the rote learning of reciting multiplication tables in order may be helpful. Here are a couple of things we’re going to be working on that I think will be a help to Antonia’s literacy in the long-term. Greek letters. They’re used in a lot of mathematical and scientific contexts, they’re easy and fun to learn when you’re young, and if you don’t learn them you will one day finding yourself reading passages like: “(shape) over d (unknown symbol) (other shape) equals the ultimate answer; where (shape) is the Infinity Constant and (other shape) is the hypotenuse of the space-time continuum”. In other words, you will have enough problems to be going on with, without having to keep shape and other shape straight in your mind. I found the Open University’s set of applets for learning the Greek letters to be very nice and efficient. The one on trying to put together Greek words at the end is just a bonus for our current purposes. Roman numerals. These might be a mere curiosity in some cultures. True, they often appear decoratively on clocks, but in the end, most of us go by position, rather than reading the numbers. In France though, it’s customary to express the centuries in Roman numerals. ‘XVIIeme siecle’ is the 17th Century and so on. That’s a nice little addition to the already pressing need to keep straight the idea that the17th Century belongs with the 1600s. Antonia has nearly reached the age where she will find it helpful to have instant recognition of all the numerals up to XXI. I was surprised that I couldn’t find any nice applets for teaching kids the Roman numerals from scratch so I’m resorting to good old-fashioned flashcards. The first 8 have the individual numerals I, V, X, L, C, D and M. The next set have I to XXI with the range of years corresponding to the century on the back. The last set are more individual numerals for building numbers with. I wouldn’t have thought of introducing calculators to Antonia yet but it’s part of the math program we’re using, so we did it for the sake of completeness. I suppose I shouldn’t be surprised that it turned out to be slower and less accurate than getting the answers by working them out on paper. So I suppose there are skills being learned here! Like remembering the string of characters you’re supposed to type into the machine and making sure that they were all registered. It’s funny how these exercises often don’t develop the skills they nominally appear to be developing – though I wasn’t sure till now, what skills calculators do develop. We also did a bit of map work with grid referencing. Finding the references was easy. The observation skills needed to find the objects we were supposed to be referencing in a small map… not so much. Antonia is whizzing through her maths book so fast these days, I thought we would try something different as well. A lot of the other homeschooling families I know in France use Mathematiques des Freres Lyons. It’s a free program from Canada, for children aged 5-7, especially home-educated kids, and I suspect it’s only available in French, because I’ve never heard of it elsewhere on the net. It turns out that anyone who can read French well could use this program with their child, even if the child doesn’t speak French. I sent off an email and received the first six chapters of the program in pdf format. Each chapter contains a series of exercises based on manipulatives that you can easily make, or that you probably have around the house, like a pack of cards. There is very little writing or recording, and the emphasis is on the child developing their own thought processes through working with the manipulatives. The first chapter is just for the parent’s information and is a series of exercises to see if the child is still a pre-operative thinker. The program tends to assume that they will be. The first test is quite well known: it involves half filling a clear bottle with water, sealing it, showing it to the child, then tipping it on its side. Many young children will believe that the bottle no longer contains the same amount of water. These tests were interesting to me. Antonia is mostly a post-operative thinker. She can quantify large groups of objects in her head and does so automatically, and can explain all the conservation tests. With one big exception: she has not mastered the intersections. When shown a picture of 3 lions and 2 donkeys she will say that there are more lions than animals, even if previous discussion has established that lions and donkeys are both animals. I was surprised enough that I did the test again, in English with other categories and got the same result. I think that explains a lot about her thinking, as she often seems very adult in her reasoning, and then there will be a sudden black hole of comprehension. Strangely enough, she can do Venn diagrams, presumably because she’s been alerted to the need to pay extra attention in that exercise. Based on the expectations of the program, it might have been more appropriate to start it a year or two ago, but I’m still finding it useful for us. Antonia has this tendency to leap to answers that seem obvious to her and flounder if they are not obvious. She finds it hard to deal with situations with multiple answers or no answer at all. She also finds it hard to prove or explain things that seem obvious to her with a physical demonstration, or to manipulate objects and experiment with them. I think it’s really good for her to learn all those things, even if she already has the numeration skills. It’s also fun, more like games really. We’re both really enjoying it so far. The dodecahedral calendar is from this site. For the pictures you can choose from a list of artist, or upload your own. It would be neat to make a small picture for each month of the year, but we didn’t get that far. 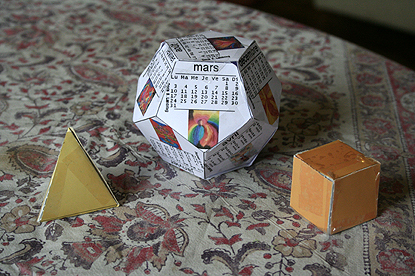 The other two platonic solids are from Antonia’s maths book, but you can get all five of them here.